Calling all Audrey Allman fans to Whilden’s Trunk Show event this Saturday from 10 am – 6 pm! Audrey is known for unique handmade jewelry – all created to be worn either individually or bundled. From delicate earrings to stackable bracelets to statement necklaces, this brand offers something to complete any outfit. You can meet Audrey in-store between 11 am – 1 pm on Saturday while you try on some of her sophisticated pieces. Beer, Snacks and Free Gift Wrapping! 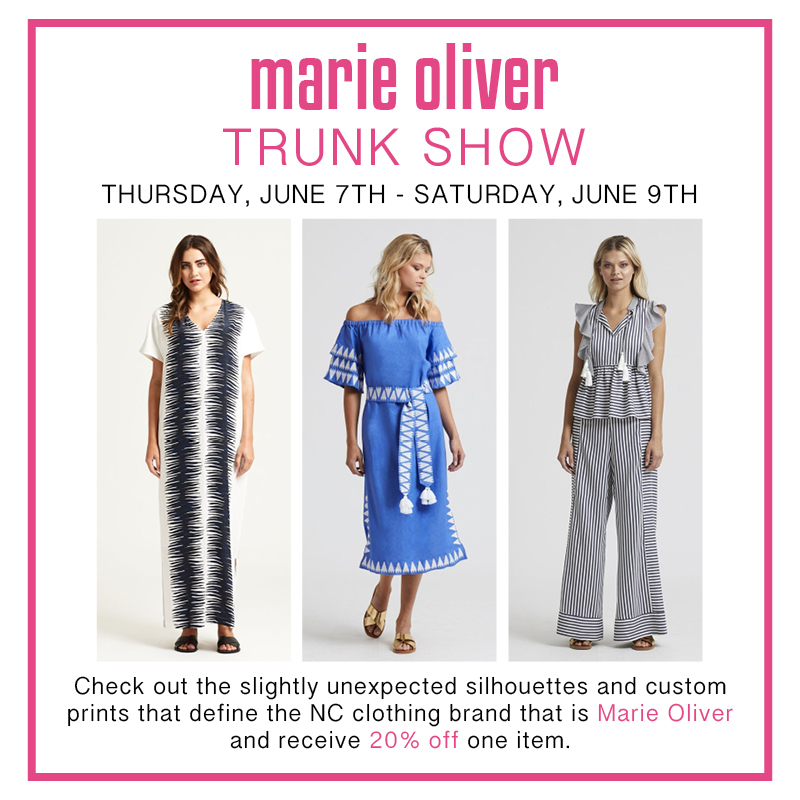 Join us at the Cupcakes and Cashmere Trunk Show! Love accessories? Care about the environment? We do too. That’s why we’re excited to host a Machete Trunk Show from September 28-30. Machete is known for its eco-conscious tortoise shell jewelry and accessories. Come by Whilden and discover a Machete bracelet or earrings you can enjoy every day. Grab you Trapper Keeper and cash in on 20% off your BTS wardrobe at Whilden. Discount is valid on purchases this Thursday through Sunday. Be there or be square! Let Whilden Host Your Birthday Party! Let Whilden host your next birthday party. You and your friends can enjoy a private shopping night, complete with champagne, nibbles and a stylist to ensure you find the perfect outfit. RSVP with us and we will handle all the details. Email courtney@shopwhilden.com to plan yours! Check your watch, ladies, and get ready for Whilden’s Around the Clock Shoe Sale this Saturday, June 23. From Kaanas sneakers and Cocobelle sandals to Botkier wedges and Dee Keller heels, we have every pair of shoes you need to complete your summer wardrobe. Shoe discounts change around the clock. The Allie Beads Trunk Show is taking place at Whilden May 3-5. Sip a margarita and dive into the Cinco de Mayo fun as you peruse this unique handcrafted jewelry, made by the mother/daughter duo. We’ll have bracelets, rings and necklaces to complete any outfit. (No two necklaces are ever alike!) Adios! Doesn’t it feel good to give back? On April 26, we’re making it pretty easy. Shop at Whilden and we’ll donate 20% of all sales for the day to Habitat for Humanity of Orange County. Your good deed for the day is done! Whilden is a proud sponsor of Habitat for Humanity’s High Heels and Hard Hats Fashion Show on April 28. Get tickets now. Jump into spring with our sale!